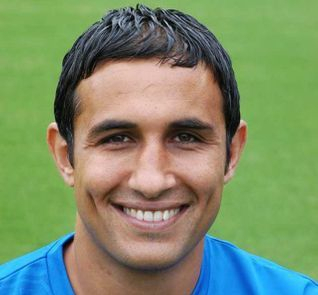 Having won England Schoolboys honours, Jack Lester came through an apprenticeship at Grimsby Town in 1994 as a striker, waiting until the ’96-7 season before breaking through into The Mariners’ first team, when the club turned to youth to play its way out of relegation trouble. Speed off the mark and the ability to turn and lose a marker were early features of Jack’s game. An eight-minute hat-trick for Grimsby against Oldham in ’97-8 helped establish him as a regular, and Jack overcame injury to play a part in helping Grimsby up through the 1997-8 Division Two play-offs, while also winning the Autowindscreens Shield at Wembley. Grimsby accepted a £300,000 offer from Nottingham Forest for Jack in January 2000 and he responded by scoring the fasted goal ever recorded at The City Ground, after just 14 seconds of the match against Norwich in March. A groin injury limited his chances after a good start to 2000-1, around the time that Forest were beginning to look upon Jack as a creator of chances for others, rather than as an out-and-out goalscorer himself. By 2001-2 Jack was firmly entrenched in the hole behind the front two; settled and productive there, he helped his side to the play-offs, but was rather surprisingly released at the season’s end. Jack signed for Sheffield United at the start of 2003-4 and became a firm favourite with the Bramall Lane faithful. He put eight penalties away in that season and must have been surprised to find himself starting the following term on the bench; by November 2004 he was back in Forest colours, but a cruciate ligament injury in his second game back ended his season. Returning to action after ten months on the sidelines, Jack was by now used mainly as an “impact sub” by his club. He enjoyed a starting run as Forest reached the 2007 League One play-offs but was released in the summer, a move which left Forest fans again bemused. Forest’s loss was our gain, of course, and Jack’s desire to stay local to a young family helped seal his transfer to Chesterfield. His impact was striking, and immediate: his 25-goal return from 35 starts was the club’s best for 50 years. He was voted into the PFA League Two Team of the Year and swept the board at the club’s end-of-season awards. Jack took fearful punishment from agricultural defenders but provided an effective link between midfield and the attack. 2008-9 saw Jack finish as the division’s leading scorer; an achievement made more creditable by the club’s playing more to Jamie Ward’s strengths than Jack’s for half the season. Historians were having to go further back to find suitable comparisons between Jack and other Spireite greats and, by finishing with 20+ goals for two successive seasons, Jack emulated Jimmy Cookson’s achievement from the 1920s. Jack missed a chunk of the 2009-10 season with a persistent knee injury but returned to score in the final first-class match on the Recreation Ground. 2010-11 saw Jack serve as an effective fulcrum for the attack, and the likes of Craig Davies and Deane Smalley owed many of their goals to Jack’s influence on a game. The championship of League Two was secured, but for many the highlight will remain Jack’s hat-trick in the 5-0 demolition of Rotherham United in March 2011. The following season ended in relegation but Jack can be excused blame for this, since he spent a large portion of it sidelined with injury. He scored an important, nerve-settling goal at Oldham in the JPT area final and, as captain, he led The Spireites out at Wembley for the final, but hobbled off, deeply distressed, after 35 minutes of the defeat of Swindon Town. Jack’s last season was a stop-start affair. A contract extension that seemed favourable to all parties in January never materialised and a back injury kept Jack out of the side as the team played out the end of its season. There was room, though, for one last emotional appearance in the number 14 shirt, against Exeter in the season’s final match. Jack and the fans got what they all wanted when he chipped home a first-half penalty in front of the home fans in the south stand, and Jack being Jack, he rounded things off by putting one into the north stand goal during the second half, too. How do we place Jack’s achievements here into a 146-year context? Going into his last game Jack was 37th in the list of the club’s leading appearance-makers. That’s ok, but turning our attention to the list of Chesterfield’s career goal scorers reveals the man’s deservedly legendary status. Jack’s two goals in his last game lifted him to 85 goals from 197 Football League appearances and he stands level with the remarkable Jimmy Cookson in sixth place in this list. He keeps company with some mighty names from our past - Ernie Moss, Kevin Randall and Harry Clifton among them, and no discussion about this club’s great goalscorers will ever be complete without Jack’s name being on someone’s tongue. Jack turned down offers from League Two clubs to take a year out of active participation in the game; he is to complete work towards his coaching badges and plans to travel to observe coaching methods on various continents. For Chesterfield: 155+42 League appearances, 85 goals.